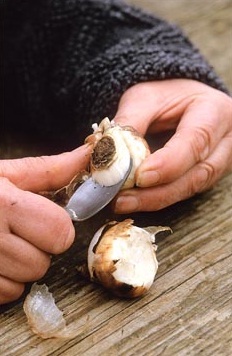 Growing bulbs and from seed produce large numbers of new plants but may take years before they flower. 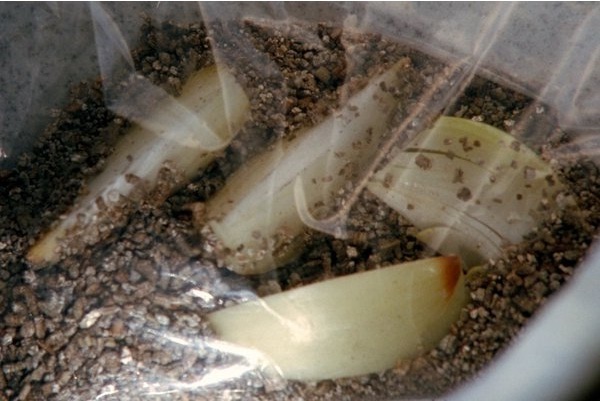 Many bulbs can be easily propagated by removing and planting the offsets that form naturally around the base. Lilies produce bulblets at the leaf axils or around the base which may be used to propagate. Some may not produce offsets or bulbuls and can be propagated by chipping, cutting the bulb into pieces and planting them like new bulbs. Other similar methods are scaling and scooping. Cleanliness is essential to avoid the spread of disease and infection though cut surfaces. Use a sterile knife. When the foliage has died, lift the dormant bulbs and select healthy and undamaged specimens. Trim the growing tip and the roots, taking care not to damage the basal plate. Place the bulb on a clean board with the basal plate uppermost and with a clean, sharp knife, cut downwards to divide it into two halves, rather like preparing onions for cooking. Cut each half again in the same way, making sure that the basal plate is divided equally between all four sections. Then, cut each quarter into four sections to make sixteen pieces in all. Soak them in fungicide for quarter of an hour and allow the moisture to drain. Half fill some plastic bags with a moistened substance like sawdust or vermiculite and put several chips in each bag. Tie the bags and store in a warm, dark, well-ventilated place. Bulblets should appear around the basal plate after some time. Plant each chip into a small pot filled with a good potting mix and place in a sheltered site to grow on. This works well with lilies. Clean the bulb, discarding any damaged outer scales and break off about six good scales as close as possible to the basal plate. Place some fungicidal powder in a plastic bag, add the scales and shake thoroughly to coat the scales. Remove the scales and place in another bag containing a half and half mix of peat and perlite. Inflate the bag, seal and store in a warm, dark place. Bulblets should develop on the scales. Plant the bulblets either singly or in groups in small pots, covering with coarse sand and leave them in a warm, light place. Harden off in spring in a shady place. In the autumn, when the bulbs have grown, remove from the pots, separate them, pot them up or plant them in their permanent site. Use a specially sharpened teaspoon to scoop out the centre of the basal plate. The exposed part is dusted with fungicide and the bulb kept upside down in a warm, dark place. 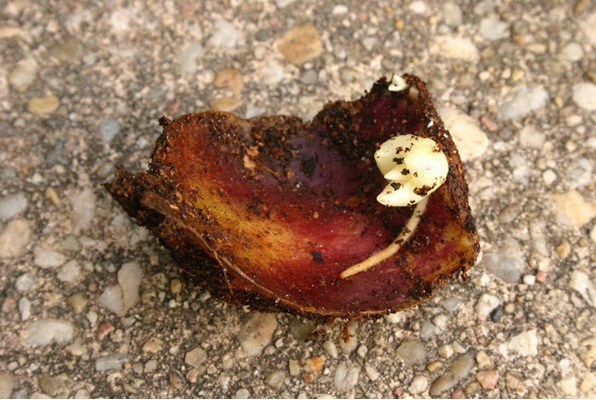 Bulblets form around the cut surface which may be separated from the parent bulb and grown on in the same way as bulblets.